There are many separated green bike lanes and bike boxes across Portland. But those new to the area, or unfamiliar with the lanes, may not know how to treat them. PORTLAND, Ore. — More than 570 people a week are moving to the Portland metro area, according to our news partner The Oregonian. Some new faces aren't familiar with Portland's bike infrastructure and may be wondering: How do I navigate it? You'll notice green paint is used to make cyclists more visible, make the roads safer and reduce crashes. 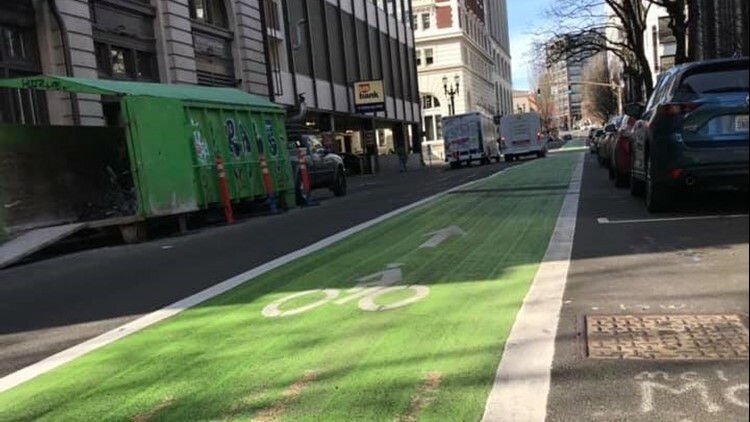 The Portland Bureau of Transportation says decades of research show the painted lanes and bike boxes are improving safety and reducing conflict between drivers and cyclists. Bicyclists we spoke with agree. “Since they're more visible, they're less likely to be hit even though they kind of are in the mix,” said Steve Vaneck, who has lived in Portland for 13 years. "Share the road" is a motto in the Rose City, where cycling is a popular way to get around. “I think traffic is getting worse. The roads are tiny. There’s so many bicyclists, especially during summer. I mean, it’s a main transport here I think for a lot of people in Portland,” said Erica Dalton, who moved to Portland last year. You can never park on a solid green bike lane or box. Oregon law says you can go through a bike lane to make a turn, change lanes or get to a parking spot or driveway. Both Coffin and Dalton believe there needs to be better education so the public knows what’s going on, as well as more signage posted throughout downtown, in particular. “To have everyone be guessing, that’s not going to add up statistically to be something very positive, so I think it would definitely be useful to have more information on it,” Dalton added. Right of way laws require drivers yield to a bicyclist in the bike lane at all times. PBOT advises you cross the bike lane to turn when you see white dashes indicating to everyone on the road that there's a mix of traffic and merging or weaving will occur. If you're new to the area, or don't bike much, you may be wondering what the green bike boxes are. They're designed to prevent crashes, especially between drivers turning right and cyclists going straight. Drivers have to stop behind the white line at a red light. When it turns green, yield to cyclists before turning. And cyclists: Watch for drivers. “It’s nice to be able to be in front of cars there so that as a cyclist you know you're being seen,” Vaneck said. Green stripes are called cross-bikes. They indicate the extension of a bike route through an intersection. They were created to make it clear to drivers that it’s a spot where there may be folks walking and biking across the street. However, unless there's a stop sign or light, you don't have to stop automatically for cyclists in the cross bike lane. It's on the cyclist to watch for cars. Meanwhile, cycling advocates tell KGW they wish there were more physically protected lanes with concrete or plastic barriers.